Rihanna has urged U.S. President Donald Trump to increase government efforts to help American citizens in hurricane hit Puerto Rico. The Caribbean island, which is a U.S. territory, was struck by Hurricane Maria last week (end24Sep17), cutting off power on the island and leaving many of its 3.4 million citizens without access to food and water and unable to contact their families. 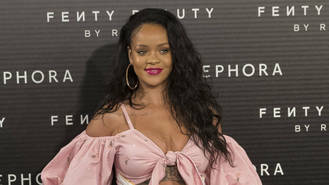 Trump has been criticised for the American government's limited response to the natural disaster and Rihanna has added her voice to those calling on the president to do more. The Umbrella singer, who is from Barbados, another island in the Caribbean, posted an image of the front page of Wednesday's (27Sep17) New York Daily News reporting on Puerto Ricans' distress. "No food, no water, no medical care for the dying...Puerto Rico needs more help, Mr. President!" the newspaper's splash read, above the headline,"American Tragedy". In her tweet Rihanna added, "Dear @realDonaldTrump I know you've probably already seen this, but I just wanted to make sure! Don't let your people die like this." The actress Alyssa Milano also tweeted the newspaper's emotive frontpage. President Trump has also been criticised for comments he made on the situation on Tuesday (26Sep17) when he said, "This (Puerto Rico) is an island sitting in the middle of an ocean. And it's a big ocean; it's a very big ocean." Rihanna later tweeted in praise of America's five living former presidents, who are raising funds to help those hit by the hurricane. Celebrity members of America's Puerto Rican community have been leading aid efforts, as Jennifer Lopez, who lost contact with family members on the island for almost a week, has teamed up with ex-husband Marc Anthony to launch a relief alliance. She has donated $1 million (£745,900) to relief efforts, while her fellow Puerto Ricans Daddy Yankee and Luis Fonsi have also been collecting for victims. Beyonce shares rare PDA with husband Jay-Z in stylish Instagram snaps. Rihanna piles pressure on President Trump to help hurricane hit Puerto Rica. Rita Ora has big plans for when she hosts the MTV Europe Music Awards in November (17). Fergie has called her former boyfriend Mario Lopez "a little player", claiming he once pitted her against her co-star. Nick Jonas is in no rush to find love as he's "content" with his life as a single man. Aerosmith have cancelled their remaining tour dates as frontman Steven Tyler battles "unexpected medical issues". Future has cancelled the rest of his Australian tour following the death of one of his close friends. Taylor Swift's alleged stalker has been committed to a psychiatric facility after being deemed unfit to stand trial. Jason Derulo's Los Angeles house has been burgled.